Fantastic doctor who is helping me straighten out my health issues. He's made sure to check things others haven't. Dr. Leung was fantastic. Prompt, knowledgeable, relaxed, and experienced. He put my mind at ease and I felt like I couldtrust him. Even though he has an air-tight schedule, he stayed and chatted a few minutes after the work was done. I highly recommend him! Dr. Leung was fantastic. Prompt, knowledgeable, relaxed, and experienced. He put my mind at ease and I felt like I could trust him. Even though he has an air-tight schedule, hestayed and chatted a few minutes after the work was done. I highly recommend him! 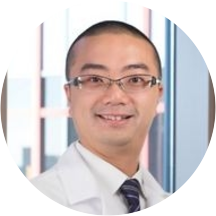 Dr. John Leung is a kind and trusted gastroenterologist treating patients living in Boston, MA. Dr. Leung is an alumnus of the University of Michigan, where he earned his medical degree. He completed both his internship and residency in internal medicine at the University of Iowa and a fellowship in gastroenterology at Tufts Medical Center. He continued his training by finishing another fellowship in allergy and immunology at Massachusetts General Hospital. Dr. Leung is affiliated with Tufts Medical Center in Boston, MA. He is board certified in allergy and immunology, internal medicine, and gastroenterology. Dr. Leung is an active member of the Phi Kappa Phi Honor Society, Golden Key National Honor Society, American College of Physicians, American Association of Immunologists, and American College of Gastroenterology. He sees patients for gastroenterology consultations as well as other common and specialized reasons. Dr. Leung’s dedication to serving others has earned him several honors and awards. He is committed to helping his patients enjoy a healthier lifestyle. Dr. Leung understands the fears and sensitivities his patients face, and he works hard to help his patients overcome their health challenges.